Entering an old mine is always exciting. The cramped spaces, the feeling of danger, that the whole world about to crash down upon your head. 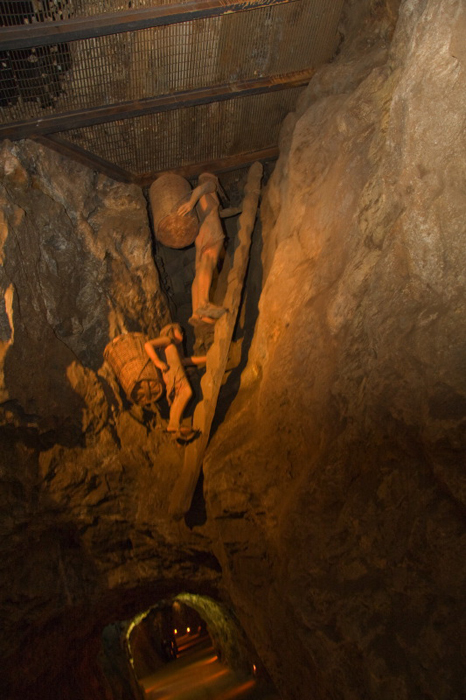 As a child I was afraid of going down mines. But I did it, but was constantly nervous, looking up and the ceiling and waiting for it to fall. I still have those feelings now, of small claustrophobic spaces, my flesh crawls when I watch people squeeze through cracks in tunnels just the light of the torch on the helmet lighting the way. It must be like roller coasters for me, there is a sense of danger, of fear. 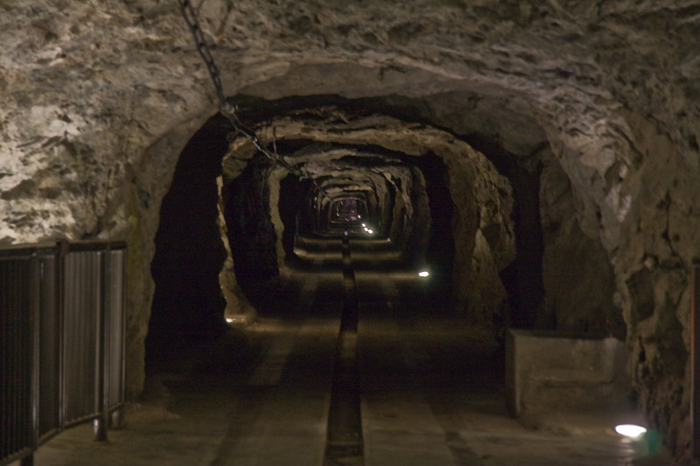 I did not feel fear once while in this mine. I guess the closest would be standing on a metal grate looking through it to the water two stories below. I was a little disappointed because it felt like Disneyland. 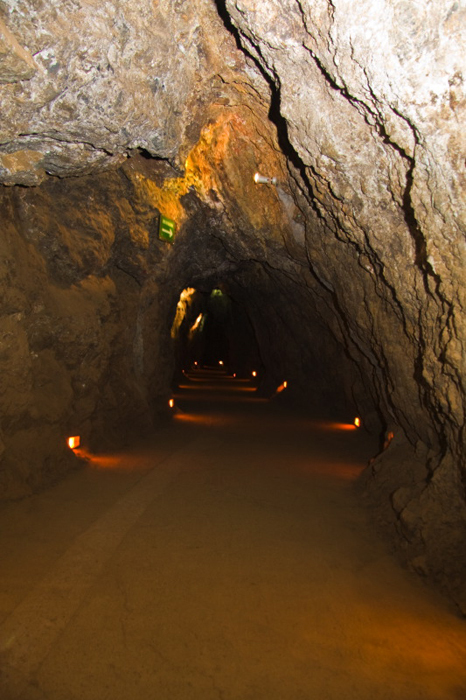 It felt like a recreation of a mine for the unadventurous explorer. 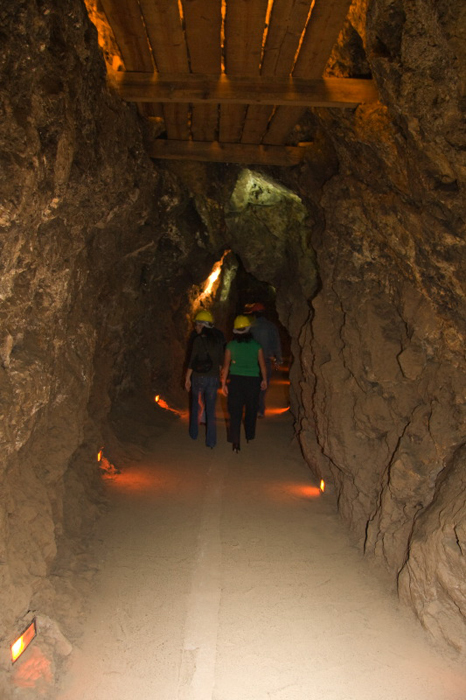 The smallest tunnel was wide enough for two people to walk side by side. And the floor was concreted smooth and flat for the whole journey. My disappointment might have something to do with the language barrier. My guide, Saul, spoke only Spanish, as well as his three other visitors. There were illuminated signs with information, so I took pictures of them and tried to translate back at the hostel. But the first one I translated as “In the year of 1898 testify to the womb.” And I am assuming that is not really what it meant. Although it could be an injunction to respect women, but I am only guessing. 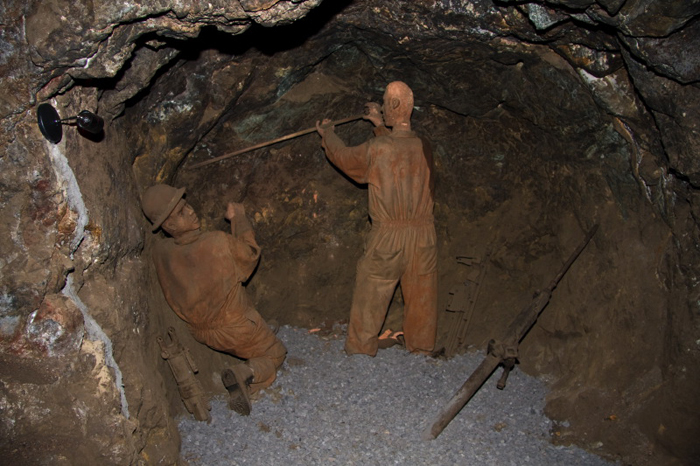 The only other piece of information I gathered that seemed important was that the mine was found in 1546. Another thing I learnt is that nadir means swim in Spanish. Which I know, because if you stand next to the railing, with an ice cold pond below you, and you pantomime diving into the water and then doing the breast stroke. Your guide will smile and say “’nadir’. 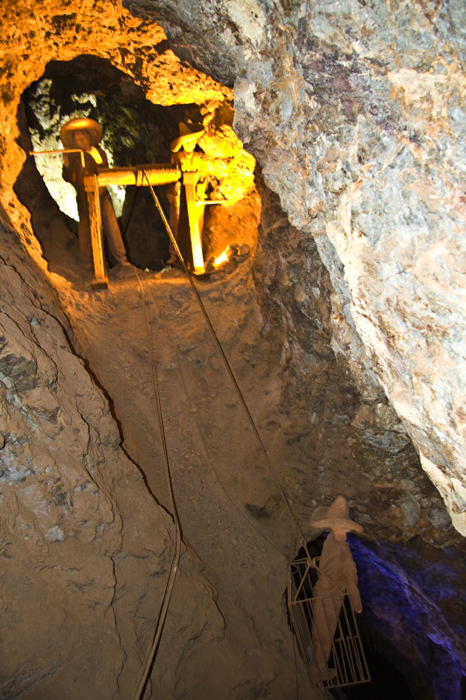 The mine is named for Adam and Eve’s first home. 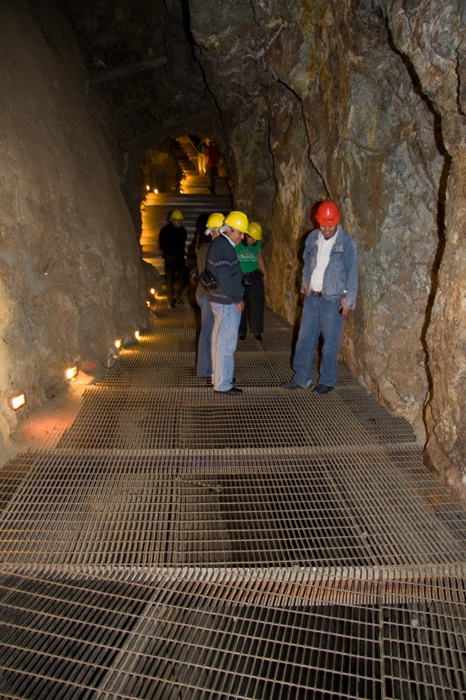 At its peak production between 5 and 7 people died each day in the mine. 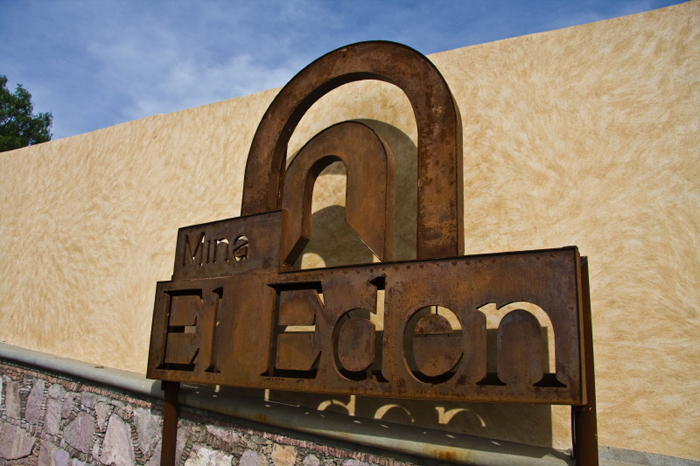 So they named it after Eden; someone has a wonderfully sick sense of humor. The squared tunnel for the train. 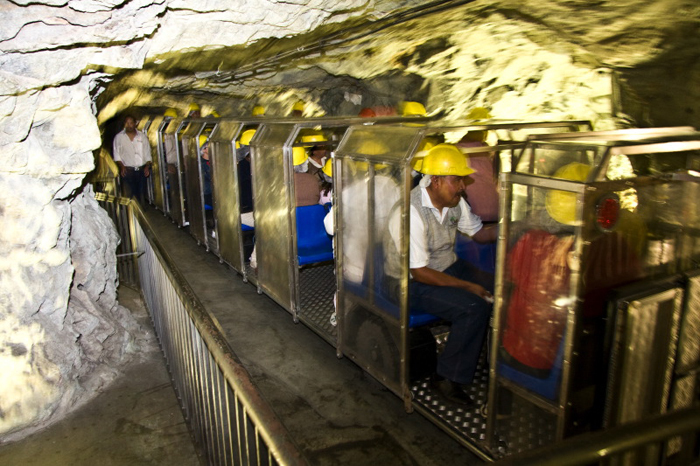 Guests entering the mine on the train. I guess I should not insult this mine, because there were a couple things that were interesting and even fun. There were dummies all over the place. Dummies holding picks and shovels. Dummies tipping over ore carts. Dummies lowering other dummies down cliff faces with ropes and a wooden cage. Although they never smiled for the camera, I had a feeling they were happy for the attention. And then there were the noises. There were of course the noises of the other tours, and people talking quietly, but above all this, arriving through hidden speakers, were the noises of picks and shovels working, and the occasional noise of a far off explosion. The mining noises just made me laugh, rather than understand the mine better. But there was one thing that made me laugh, and even get excited: that was the bar. Yes they built a bar down at the end of the train journey, in the center of the mountain. It is open on Thursday, Friday and Saturday evening. The gates were locked when I was there, but chairs and two empty bars were visible between the pillars of rough rock. 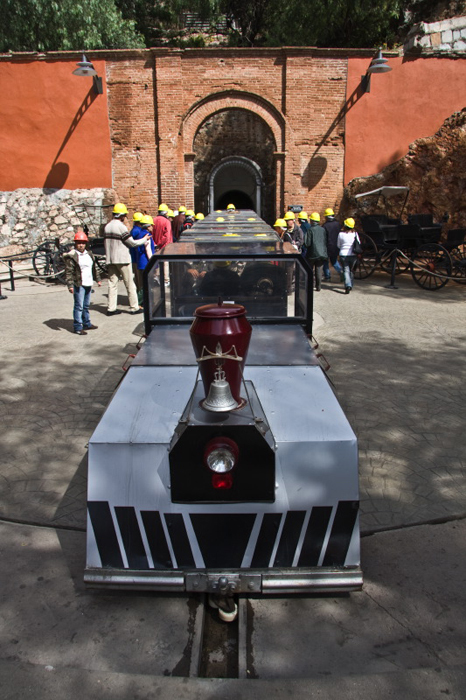 The train trundled up the square tunnel, arriving in the bright sunlight. 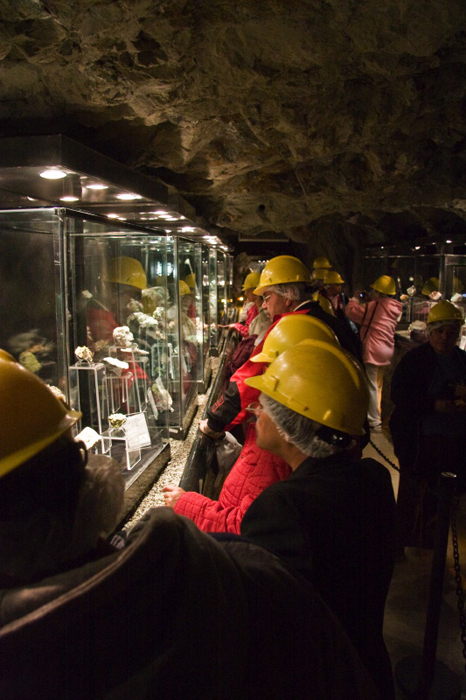 There was a whole new group of people waiting, with their hairnets and their orange safety helmets to board the train and enter the mine. And I walked back through town, marking the streets mentally, so I could find my way back on Thursday night. 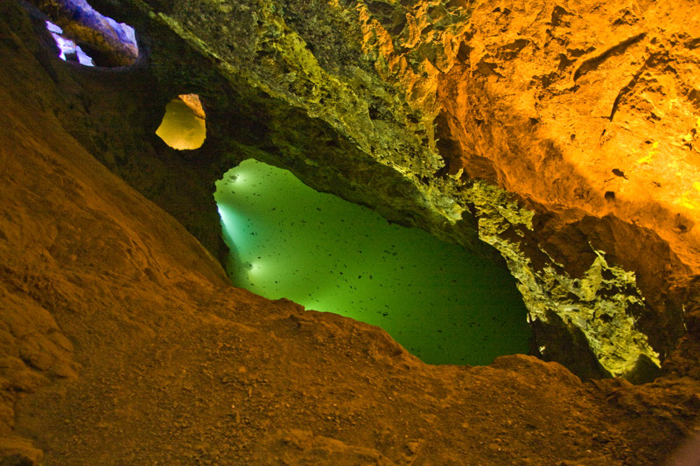 To drink in an abandoned mine. 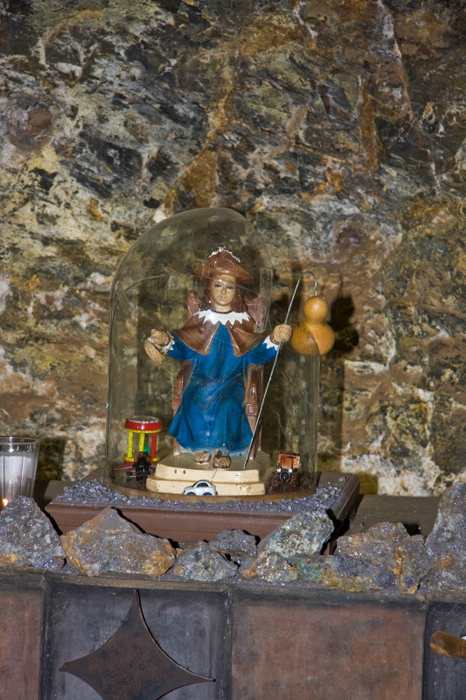 The god of the mine, quietly waiting in the dark for offerings. 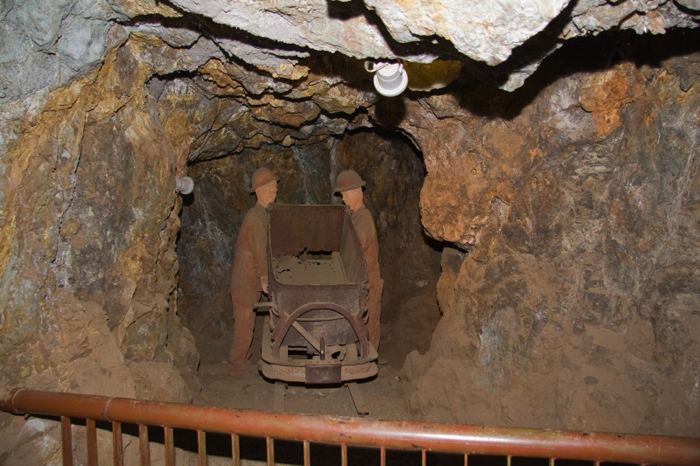 Abandoned machinery in the mine. 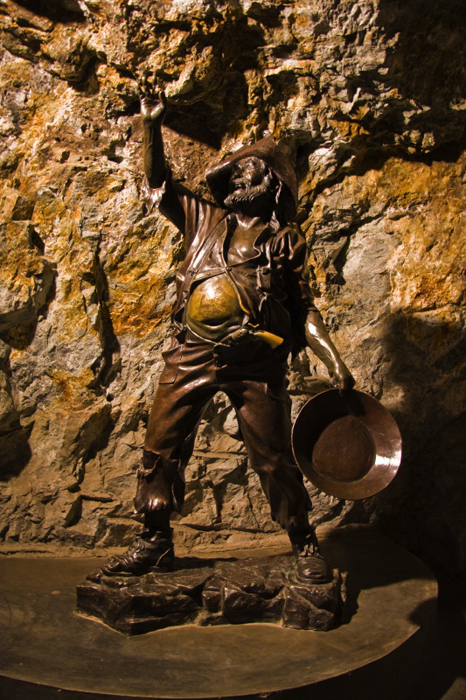 And finally a wonderful statue of a miner standing outside the entrance to the Thursday, Friday, and Saturday night Disco Club. 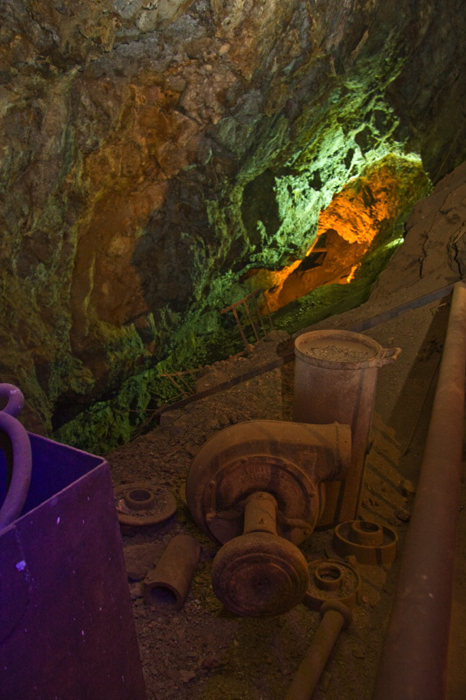 of course i want to have a drink at the end of a mine…what does one drink there? a rusty nail…a mudslide…no, i’ve got it…an adam and eve! it’s made with gin, it’s perfect! I heard from Jennifer that you were traveling in Mexico so I wanted to stop by and say hello! My new email here in Connecticut is kbailey08@comcast.net, let’s stay in touch! Have a fantastic trip, Ben.